New Delhi: In an era, where medical advancements and breakthroughs take place almost daily, our MBBS students have been studying a curriculum that is at least two decades old. 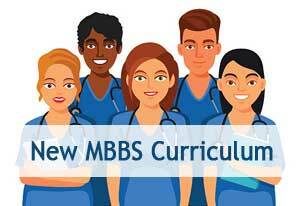 After much procedural delays and debates, the new MBBS curriculum will finally see the light of the day as the Medical Council of India Board of Governors have given their nod for the same. The new curriculum is expected to roll out nationally from the academic year 2019-20. Medical Dialogues had earlier reported that the new curriculum had been finalised and was awaiting the confirmation of the MCI general body. With the MCI being dissolved recently and the charge being handed over to the newly appointed Board of Governors, all eyes were upto the BOG to make the final call. Tribune reports that on Friday, the Medical Council of India finalised the new curriculum after the Board of Governors has approved the document which revisits the 1997 syllabus in the context of emerging diseases and scientific advances. Via this New MBBS Curriculum, apart from their usual syllabus and training, the MBBS students will also be trained in communication skills. In addition, to familiarize medical students to the MBBS programme first, instead of them jumping into the medical subjects, a two-month foundation course proposed by the medical council has also been added in the New MBBS curriculum. “Another new element is the introduction of elective subjects. Now students can pick up subjects of choice and dedicated time has been allotted for self-directed learning and co-curricular activities,” Dr VK Paul, MCI BoG Chairman told The Tribune. The new curriculum also encourages, in a first, the use of medical mannequins and models for clinical learning, even though the use of human cadavers for anatomy training will continue. The move has been taken in order to set change to the old course which is considered to be deeply dependant on theory classes. Officials from the MCI said that didactic classes will be reduced to a minimum once this course initiates. If implemented properly, it augurs well for the country and the profession. Most problems in our academia stem from inadequate, improper often unethical , implementation with too many spineless unprofessional people at the helm and too much unprofessional interference by politicians and social and print media. It\’s good news as new curriculum is required. But the problem is implementation of any new planned programme. Today most of students focus on PG NEET exams. How will you make them learn the practical unless they work in hospitals during their MBBSfinal year and internships. Instead of elective subjects MCI should have increased duration of first year MBBS to one and half year. Our old system of one and half year for all three first . Second and third mbbs was better . Students take more than eight months to understand Anatomy, Physiology and Biochemistry.If they are burdened with extra subjects, they loose interest and show less interest in basic subjects. Their goal is only to pass in three subjects and never take interest in other subjects. Then what is the USE? Waste of time!! !